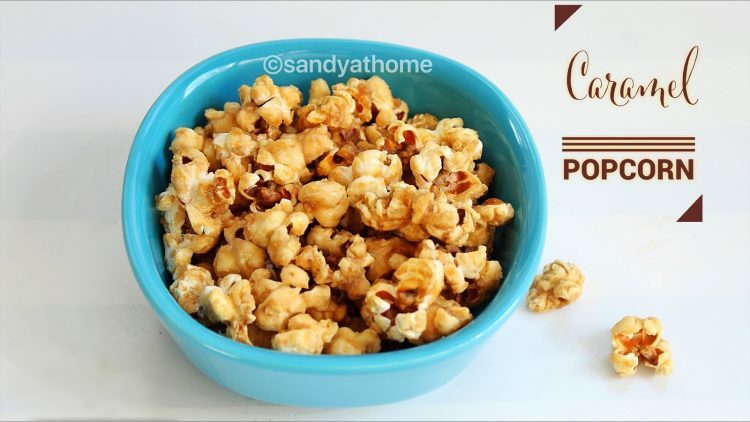 Caramel popcorn is a crunchy, sweet, chewy and delicious snack prepared by tossing freshly made popcorn in caramel. 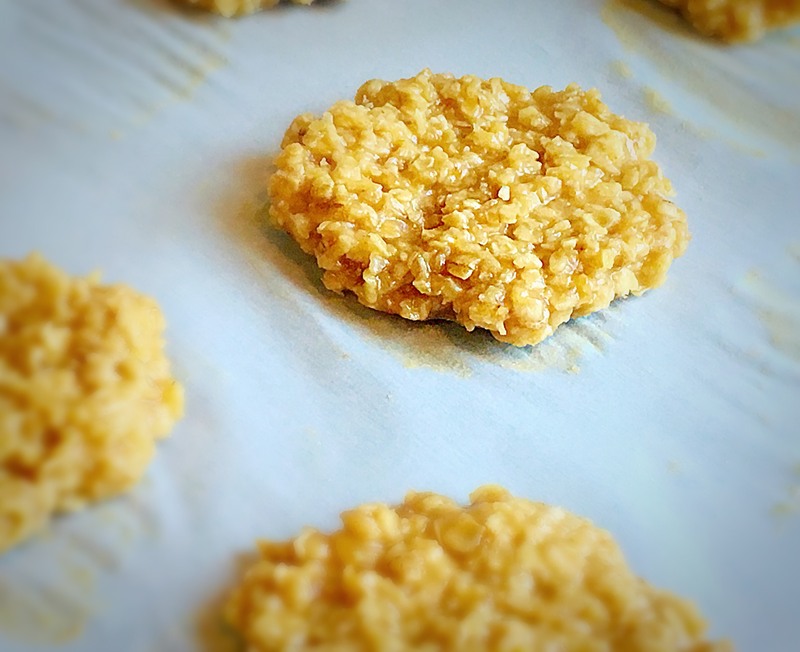 This easy and quick to make homemade snack is irresistibly delicious that it is adored by both kids and adults. 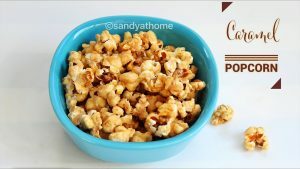 I knew about this caramel popcorn for the first time when I was in grade 4 and during my vacation in Singapore my aunt bought it for me, the instant reaction was the disliking color and taste as I am not a great fan of sweets. Due to her compulsion I tasted just one popcorn and later I finish the whole packet. So that fond I was for this, and still have no idea as to how many packets I had in those 2 months of vacation. Even now when I find these in shops I make sure to get a small pack to relish, but I always have a feeling that homemade caramel popcorn tastes far better as it is fresh and I have never seen this caramel popcorn made fresh in shops just like salty ones that we get right out of the popcorn maker as the caramel popcorn needs some rest time to harden to attain the perfect texture and crunch. So the packet ones are not much favored by me. 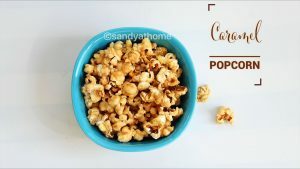 So if you also love caramel popcorn or don’t have experience on its taste try making it today. The kernels used here is popcorn kernels so make sure you don’t buy normal corn. 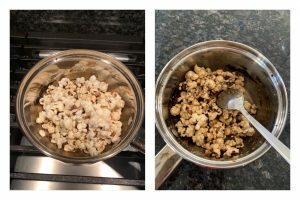 i tried to keep the recipe simple so made this popcorn in stovetop method. So let’s get to the making! Heat oil in a pan/ kadai. Try adding only one corn kernel first to check if the oil temperature is correct. 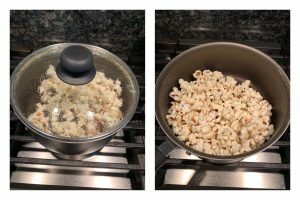 Close pan with a lid after adding the corn, if the corn pops then the corn kernel is good to make popcorn and the oil temperature is perfect as well. Now add all the kernels and toss it well in oil. Close the pan with a lid. 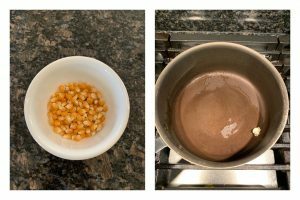 Keep the flame from low to medium and wait for the kernels to pop. 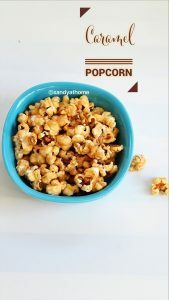 It will take about 3 to 4 minutes for all the kernels to pop. When everything looks good switch off the flame. Wait for a minute as kernels pop till the time the pan remains hot. Now open the lid and popcorn is ready. Now keep this aside and we shall make caramel for the popcorn. In a small pan add sugar and little water enough to wet the sugar. Keep the flame in medium, do not stir. When the sugar syrup starts bubbling changing color. This should take about 4 minutes. 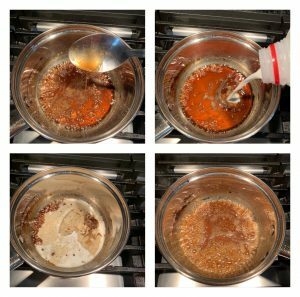 Once the syrup changes to dark caramel color add butter. Stir well when the butter is melted add milk and stir well. Be very careful at this stage as the mixture will bubble as soon as you add the milk. Once everything looks combined put off the flame and the popcorn to the caramel. Toss it well. The mixture will be sticky at first after an hour it will harden and will be ready to relish. Heat oil in a pan/ kadai. When the oil is hot enough try adding only one corn kernel first to check if the oil temperature is correct. 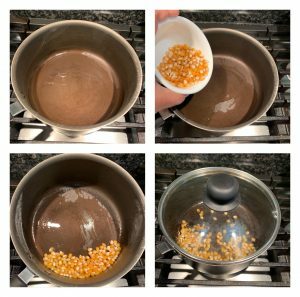 Close pan with a lid after adding the corn, if the corn pops then the corn kernel is good to make popcorn and the oil temperature is perfect as well. Now add all the kernels and toss it well in oil. Close the pan with a lid. Keep the flame from low to medium and wait for the kernels to pop. It will take about 3 to 4 minutes for all the kernels to pop. When everything looks good i.e when you see popcorn switch off the flame. Wait for a minute as kernels pop till the time the pan remains hot. Now open the lid and popcorn is ready. Now keep this aside and we shall make caramel for the popcorn. In a small pan add sugar and little water enough to wet the sugar. Keep the flame in medium, do not stir. When the sugar syrup starts bubbling changing color. This should take about 4 minutes. 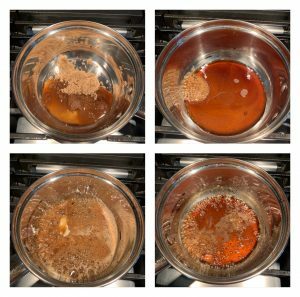 Once the syrup changes to dark caramel color add butter. Stir well. When the butter is melted fully add milk and stir well. Be very careful at this stage as the mixture will bubble as soon as you add the milk. Once everything looks combined put off the flame. Now add the popcorn to the caramel. Toss it well. The mixture will be sticky at first, after an hour it will harden and will be ready to relish.